This past Friday I got to spend an entire day photographing. 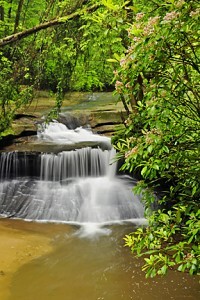 Although I was able to photograph a variety of subjects the day began and ended taking pictures of waterfalls. 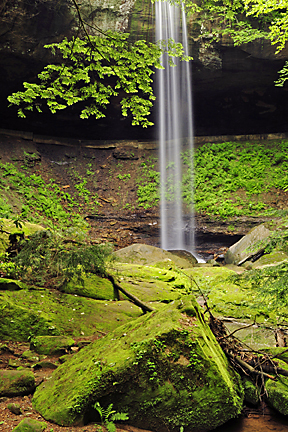 It started with a beautiful waterfall called Creation Falls in the Red River Gorge National Geological Area. It concluded at another pretty waterfall, Broken Leg Falls, in the Daniel Boone National Forest. The two waterfalls are very different but both are quite scenic and made delightful photographic subjects. On my way home I kept thinking about how the two waterfalls were both lovely but that their very different names seemed to affect my experience and enjoyment while in their presence. The name “Creation Falls” put me in a contemplative mood and made me mindful that Creation was putting on a show for me. It made me mindful of the Creator’s presence and prompted words of praise and thanksgiving. The name “Broken Leg Falls,” however, had a different affect on me. I’m not exactly sure how this falls got its name but after taking the perilous trail down to the bottom to photograph it I think I have a clue. This waterfall was delightful to behold but for some reason its name bothered me and dampened my mood. I confess I have the same feeling whenever I visit Dog Slaughter Falls near Corbin, Kentucky. Shakespeare may have believed that a rose by any other name would have smelled just as sweet but I’m not convinced that names don’t influence how we feel about things or experience them. Names are very important. The Scriptures certainly back this up. In biblical times place names and people’s names typically told a story. Names also were more than what someone might call you. Names represented one’s character. In fact, in numerous cases when a person’s character changed he received a new name. Abram becomes Abraham. Jacob becomes Israel. Simon becomes Peter. Saul becomes Paul. Names make a difference. They did then; they do now.